Review of the Archetype One, The Serif version by Silver Watch Co.
Thread: Review of the Archetype One, The Serif version by Silver Watch Co.
Disclaimer: Silver Watch Co. provided the watch for an independent review without compensation or any financial ties. I share with many enthusiasts the passion for vintage Rolex watches and this year I had opportunity to acquire a 5513 sub from the late 80s. I went through many homage watches and in the process I discovered what features I care most about and which ones I don’t mind. The significant cost of Rolex watches has created a universe of micro-brands that offer their take on the originals for considerably lower prices and some of them are worth your hard earned money and time. In this case I was very impressed with the initial images released of the Archetype One by the Silver Watch Co. Out of the several brands offering homages of the Sub, I was particularly intrigued by this one and I was very excited to have had the opportunity to check out a prototype. I was especially interested in experiencing this watch in person and be able to compare it to my glossy dial 5513. Let’s see how things shake up. Silver Watches offers 3 variation of the inaugural model, each with 2 options on the bezel type. The Maxi and the Serif models have a black, matte dial and the bezel can be either aluminum or ghost-ceramic. The third model is The Blue with the snowflake hand and the bezel either with 15-minute markers or with full 60-minute markers. None of the variations has a date complication, which makes the Miyota 9039 an excellent choice as a true no-date movement with hacking function. All models have a vintage inspired domed sapphire crystal with antireflective treatment. The prototype I received was The Serif with aluminum bezel. The case of the Archetype is, in my opinion, one of the highlights of this watch. It holds the dimensions and proportions very closely to the inspiration models with a diameter of 39.5mm without the crown and a lug to lug of 47mm. It has a fantastic height of only 10.45mm. The sides have a high-polish finish (mirror finish) while the lugs and crown guards have a circular brushing finish, roughly at 45o. The transition is razor sharp, no bevels and the lugs are drilled. The 20mm lug width makes it simple to swap straps or bracelets. Two thumbs up on the quality of the case! The bezel has a high-polish on the exposed steel frame which reflects light almost like a high-end fluted bezel. The insert in my prototype was the aluminum version, which displays all 60-minute markers. The luminous pearl matches the lume of the dial and has a very subtle circular elevation. This prototype had a fixed bezel, but in the production units we can expect a 120-clicks unidirectional rotation. The dial has a deep matte black base with white printed hour markers. This watch features the Serif version of the dial, which you can see at 3, 6 and 9 o’clock. The markers are then covered with light yellow Superluminova that matches the hands and pearl perfectly. I particularly like how each marker has a subtle white frame visible around the lume, simulating the aged Tritium. The font and logo on the dial are crisp in white and don’t overpower the symmetry of the dial. The hands are inspired by the military Sub with the sword hour hand, pencil minute hand and arrow-tip second hand. The frame is finished in high-polish, which in certain angles makes the hands stand out very nicely. There’s also Superluminova here. Silver Watches decided to use the Miyota 9039 caliber. I don’t claim to have any inside information, but I believe part of the decision was based on the thickness of the movement that would allow the case to be as slim as it is. Also, a true no-date movement removes the second “ghost” crown position as well as the midnight click from the date change, often present in no-date watches of even higher-level cost. My only complaint, if you can even call it that way, is that like the 9015 caliber, the rotor only winds in one direction, so that when the wrist swings the movement in the non-winding direction you get the helicopter effect. I was pleasantly surprised with the oyster-type of bracelet on the Archetype One. 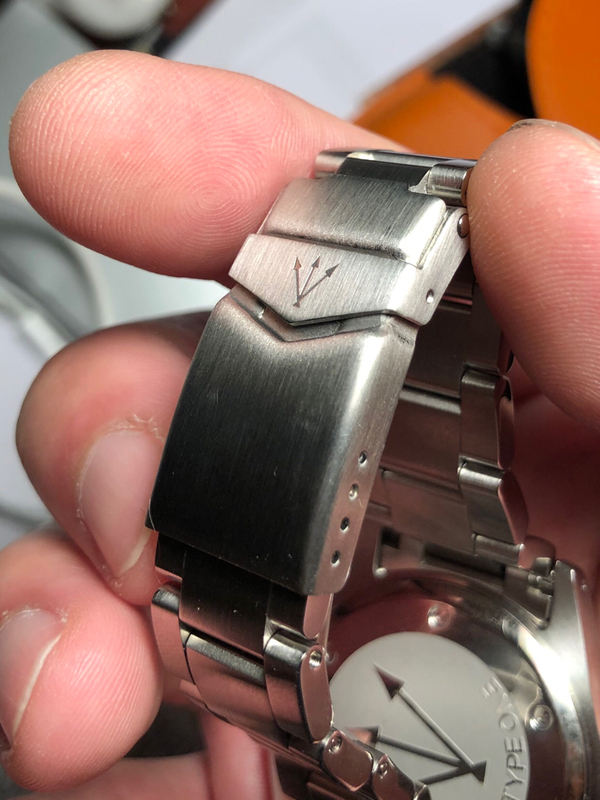 The brushed finish is very similar to the finish of the case (maybe a notch less intense) and with high-polish finish on the sides of the links. The thickness and weight of the bracelet are remarkably similar to the inspiration bracelet. It has solid links, including end-links and it tapers from 20 to 16mm. The double-lock clasp has the logo engraved but it’s a standard clasp that does it’s work well, but is otherwise unremarkable. I was intrigued when I first spotted this watch, but I must say I was very impressed once I got to wear it and compare it side by side with my 5513. As you can see, the bezel, is remarkable similar. I get the sense that this is likely how the 5513 bezel looked when brand new. The insert has the right markers and numerals that mirror the 5513, although on my 5513 I only have 15min marks. The finish of the case is excellent! The 45o brushing is remarkably similar to the 5513. The mirror finish sides match as well. Even though the lug height is greater in the Archetype One, the overall height from case back to dome of the crystal is remarkably similar between the two. The 5513 does have a subtle facet along the lugs, which is typical for the vintage models. The current sub doesn’t have a facet in the maxi-case. The bracelets are also remarkably similar in feel and finish. I’m impressed with the quality of the Archetype One for the price point. The clasp is where there’s a significant difference in quality, but details like this is what ends up resulting in significant higher prices. The Archetype One is a very impressive homage watch. I can report that while there are differences in how they wear, this watch is as close as it gets at this price point. The weight on the wrist and how it rests on it are remarkably similar between the two watches. My only criticisms are the choice of clasp and the movement. 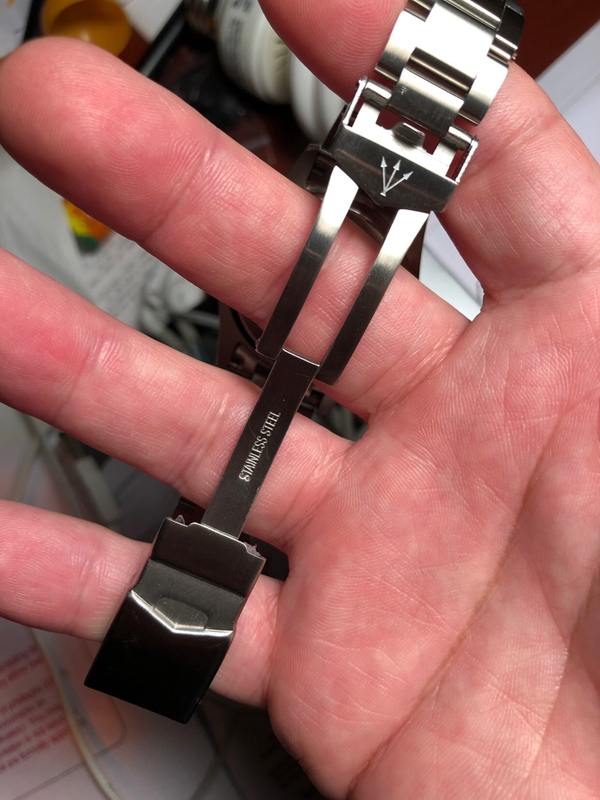 You can find the clasp on most any microbrand watch, and it would have been a nice investment to bump it up to the next level. The choice of caliber is a difficult one, but when you achieve such a nice watch you wish it could have been at least a lower-end Swiss caliber with a bidirectional winding mechanism. However, here’s is where the calculation of costs and benefits comes in, and I can only congratulate the Silver Watch Co team for being able to offer such a great watch at such competitive price! No wonder the initial pre-sale was sold out very quickly. If you are on the lookout for a great submariner homage watch, this is the one you’re looking for. Check them out here: https://www.silverwatchco.com/ where another round of pre-sale watches will be offered soon! Please don’t hesitate to ask any questions and I would appreciate you dropping your comments below. Last edited by Jguitron; December 3rd, 2018 at 07:03.
n1k0, Bloom, Toh and 25 others like this. Re: Review of the Archetype One, The Serif version by Silver Watch Co.
Great review! I've never even been into subs or sub homages, but somehow your review managed to catch and hold my interest. Beautiful pics too. How about a shot of the clasps? I've pre ordered the blue one on a whim but it looks I might not have left much of a mistake! Here are a few quick pics. robbery, Dec1968, Bloom and 2 others like this. nice review, glad to hear it follows through on expectations. Great review and nice pics, too ! Was waiting to see some real world shots of the Serif with the aluminium insert. Looks like i definitely made the right choice !!! Any chance of a shot on a black or grey Nato ? Ahh I see what you mean, not really on the same level as the rest of the watch. A glide lock would have been a nice touch. I think they sell them on eBay if the bracelet ends are 16mm. What kind of clasp does your original have? I’ll shoot some pic of it. The reference escapes my mind right now but it’s the period correct bracelet and clasp. Is the crystal on the Seawolf Ti the same as the new steel model? 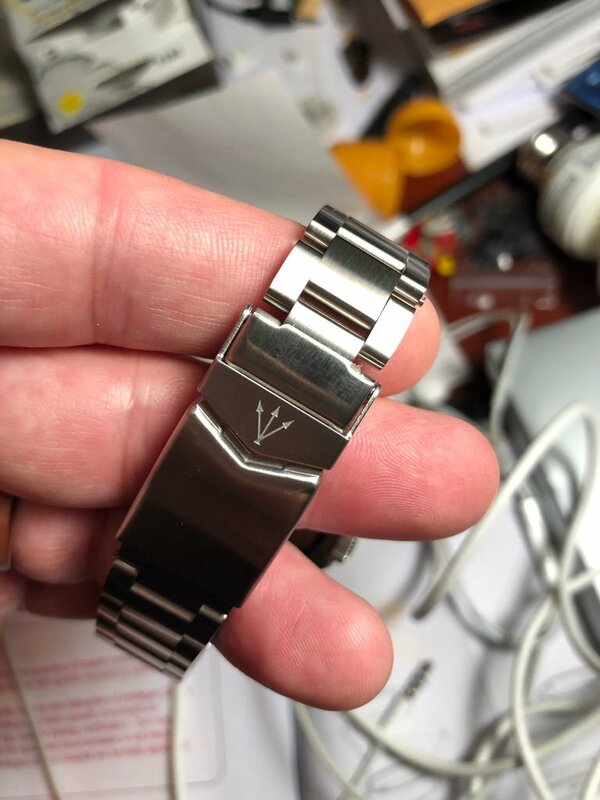 Anybody amazed how dirty the folds on the band on the side of the 5600 get?